McDonald said Fianna Fáil should ‘put their foot down’ over the housing crisis and call time on this government. SINN FÉIN LEADER Mary Lou McDonald has called on Fianna Fáil to pull the plug on the government and call a general election after a photo emerged yesterday of a family of seven spending the night in a Dublin garda station. Gardaí confirmed that a young mother and her six children – aged from one-year-old to 11 years old – presented to Tallaght Garda Station during the night as “they had nowhere to go”. Members of An Garda Síochána tried all emergency lines in relation to homeless shelters and no accommodation was located. In an interview with TheJournal.ie, McDonald said the photo is “the most tragic reflection of where we’re at in the housing crisis”. If that doesn’t sum up where we are at I don’t know what does. They say a picture paints a thousands words. In many ways, there is no need to say anymore, just to simply look at that image, and the misery, the desperation and the stress in that picture, and the failure – the huge failure – by the State that is reflected in that picture. McDonald said Fianna Fáil need to take action and pull the government down, stating that Fine Gael are incapable of solving the housing crisis in Ireland. Fianna Fáil should pull the plug. We should have an election. We should have a government that can deliver for the people. The Dublin Central TD questioned why there was silence from the government about the incident. While she said the blame falls on government, she believes Fianna Fáil also have questions to answer, stating that the party is keeping Fine Gael in government. “If we lived in a rational, political environment what would happen now is Fianna Fáil, the party keeping Fine Gael in government, would simply put their foot down, draw the line and force an election,” said McDonald, in a statement that indicates her party are election ready. When asked would her party consider putting down a motion of no confidence in the housing minister if the housing crisis does not improve over the next few months, something she threatened previously, she said Sinn Féin shouldn’t have to. Fianna Fáil are complicit in this, they are not disinterested observers. Dubbing the confidence and supply arrangement between Fine Gael and Fianna Fáil “political fraud” she said she was never “enamoured” with the deal. “It was Fianna Fáil being cute and being in government and opposition at the same time. They are keeping this government in power, so do they stand over their actions – what have they to say about the misery in Tallaght Garda Station, what is Fianna Fáil’s answer to that because they have to be answerable alongside Eoghan Murphy and the Fine Gael government,” she said. She added that she did not believe this government has “the capacity, the imagination, or the will to really get a hold of the housing situation”. Neither Fianna Fáil or Fine Gael are going to sort out the housing crisis, in her view. “I don’t think they can, I don’t think they have the type of thinking, or energy or political will,” said McDonald. McDonald is not the only politician questioning the effectiveness of the government’s housing policy. Dublin South West TD Paul Murphy said the case of a family forced to sleep in Tallaght Garda station highlighted how the government’s reliance on private landlords and builders to provide social and affordable housing is failing. 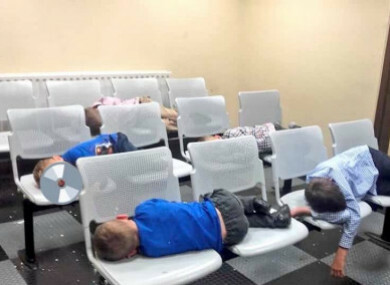 “The image of six children forced to sleep on metal chairs in Tallaght Garda Station should haunt this government. Scenes like this are being played out across the country every night of the week whether it’s families in Garda stations or tents on beaches,” he said. While McDonald called on Fianna Fáil to step up and take action, a statement from the party’s housing spokesperson Daragh O’Brien said housing crisis under Fine Gael leadership “has worsened”. The full interview with Sinn Féin leader Mary Lou McDonald, where she discusses the border poll, Brexit, and what she’s doing about bullying allegations within the party, will be published this weekend. Email “Mary Lou on Tallaght Garda Station photo: 'Fianna Fáil should pull the plug. We should have an election'”. Feedback on “Mary Lou on Tallaght Garda Station photo: 'Fianna Fáil should pull the plug. We should have an election'”.